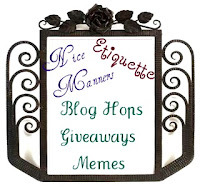 Just a friendly reminder for when you are hopping around entering giveaways and joining weekly, daily, or other meme hops, that there is a nice way to show your appreciation to those bloggers who spend their time working hard to make your hop experience pleasant and fun. #1) If you join a blog hop (daily, weekly, meme), don't expect to only put up your links and receive. Show some courtesy and give back to the hop host(s). #4) PAY ATTENTION! What kind of hop is it? Is it facebook? GFC? Twitter? Make sure to leave the correct URL for the correct Hop!